Never in my life have I had such a perfect training block leading up to a race. I guess that is a bold statement to make, but I feel like there is always some sort of question or apprehension, some little nagging injury or training fall-out that makes you question the pending performance. This year, this race, and with race week taper in full force, I was so content with every single mile I had put in and the output of fitness it produced. I was running faster and stronger than ever. With a second-place finish last year at Zumbro, and no Kurt Keiser (2016 winner and course record holder), no definite slam dunk winner on the start list, I had one thing on my mind. One goal, one mission, a singular reason to toe the line. I wanted to win. Bad. It’s a tough thought to have, and an impossible one to wash out of your mind once it creeps in. As fit as you are, you can’t control who else is on that start line and what sort of shape they are in. Well, if you’re Tonya Harding you have that control, but I don’t own a baton. Either way, I was racing for the top spot. 12 months prior, I ran 8:32 while pacing for 9 hours. I hit just under my goal of 8 hours at Voyageur 50 with less-than-ideal training, and so I figured that 8 hours would be a good benchmark or time to pace off of. Then again, Zumbro is a hard course. The midnight start adds a different level of complexity, but 2:40 each 16.7-mile loop works out so nicely! My plan was to try to hit a tad under 10 minute pace for two loops and then let ‘er rip. The weather was looking simply perfect for the run. Low 40s and dry for the whole night. I drove from Duluth Friday morning after getting a solid 11 hours of sleep, plus took a nap. It’s such a weird day just milling about, waiting for midnight. I left from Minneapolis around 8:30pm for bluffs country and got there in a breeze, but didn’t have much time to take a nap. I got my packet and hung out around the bustling start/finish/lap area and drank Mountain Dew until the start. I saw a few friendly faces from last year, Jeff Vander Kooi and Bennett Isabella, and before long the countdown began. Watch on, headlamp on, “GO!”, start watch, start running. I got swallowed up by a pack of guys, which was perfect. It’s a little freaky starting out the run in the pitch dark and not knowing exactly where the trail goes. This is race is so incredibly marked with reflective ribbons and a clear trail that’d truly be difficult to get lost on, but you don’t remember that in the anxiety-provoking first minute of the race! So we started towards the woods. It is not long before the trail turns onto some technical singletrack that goes up, up, up. It is comical how the first mile or two of the race is so incredibly challenging! We were trucking pretty well, everyone was on the same page of walking up hills, and we were making good time. Jeff and I were up front and chatting away, which was nice. Bennett chimed in, and I talked to fellow Duluth resident Ryan Braun a bit. With the first aid station in sight, someone sprinted out from the group into the night. We looked around to each other and Jeff even asked, “who was that? ?”, almost offended that he’d run away like that this early in the race. I was offended because I wanted to win. It is way, way, way too early in a race like this to go after him. So either this guy is the real deal or he’s a clown and will blow up. It’s not like we were going slow, but this guy blasted way out in front and sprinted out of sight. I made a point to eat something at the first aid station, as was my goal and plan for every aid station. The pretzels were not appetizing whatsoever, and I was the only one in the group to stop. I had to pee so bad, and lost my spot up front after the stops. There was a group of perhaps eight guys in one big pack, and I weeded my way back up. I didn’t recognize half of them, but started talking to TJ Jeannette, who chimed in when he mentioned he was from Duluth. I recognized his name from ‘Superior’, a book I read about the 100 mile race with the same title. We were all chatting away and running well–nice and fast but manageable–so the miles clicked away in the night. I peed at least twice before the third aid station. For some reason, I felt like I had to break from the pack. I was good on water, and certainly not hungry, so deviated from my plan and skipped the third aid station of four per lap. Jeff was the first one out of the aid station and could have hung with me, but probably saw what I was doing and let me go. I was pushing the pace at that moment anyways, and kind of felt the time for chit chat was over. We hadn’t reeled the other mystery dude in at all, and it was time to focus. After that third aid station, it’s relatively easy running until the next lap. I was getting a little carried away all alone, running fast and breathing hard. My watch didn’t seem to be splitting every three miles like I set it to, or I couldn’t hear it and was missing it. I was frustrated about that. Either way, my pace was on point for a 2:40 loop and I felt pretty decent. My fueling was going good. Perfect, really. 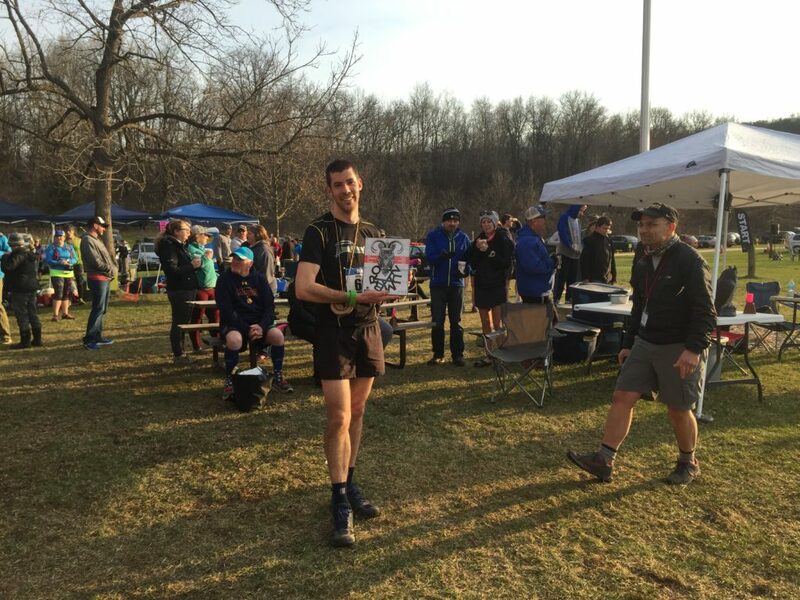 I got some varied feedback from 100 milers and volunteers from the fourth aid station, and the guy in front of me was probably 5-10 minutes ahead. A lot of race left to run, I thought. The moon was great, the temperature ideal, and trail in pristine condition. I sprinted across the finish line, grabbed some goodies from the finish aid station, got a fresh couple of gels from my stash, and ran out onto my second lap exactly at 2:40. I even said “two more of those and I’ll be all smiles”. I forgot to put my extra batteries in my waterbottle pouch. Do I turn around? No. It was a bit harder to pace the start of the second lap without the big group to pace. I tried to hit an intensity that was mild but deliberate, especially on the uphills. You don’t want to really run or push it too hard, because that is where you blow up. 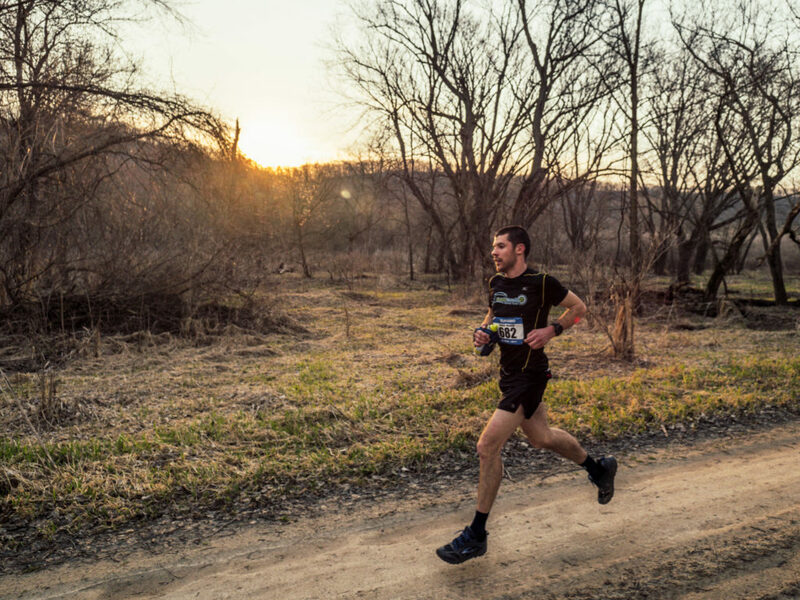 There are plenty of hills that will destroy you at Zumbro. I had fun running in the night going into the first aid station on lap two, and was feeling spry and energetic. I altered my gel-and-hour plan, which pretty much threw my whole nutrition plan out the window after I’d skipped one aid station already. Oh, well, it’s better than trying to stick to a stupid plan just because, and throwing up or pooping my pants or getting terrible stomach pains. Between the first and third aid stations is hard. The sand couloir section was really terrible, and I got a little frustrated with that and the unrelenting hills. My legs were definitely starting to feel it, and time slowed down. 21 miles. 22 miles. 22.5 miles. 22.6 miles. Gah, just get to half way!! Things could be much, much worse, though, and I was still running well. I figured that I was breathing too heavy on the second part of that first lap and paying for it now. At the second and perhaps third aid station (as they are the same physical aid station), I talked to my cousin-in-law Dan, who was volunteering once again. He said that the guy in front of me was at least 17 minutes up, and how he sprinted up the steep hill out of aid station two, and how he’s twice my age. Well, CRAP! So the win is unreachable. No way, no how. I did some quick math, but didn’t have to do any calculations to know that either I’d have to speed up quite a bit, or he’d have to slow down a lot, for me to have a chance at this stage in the race. But second place is still great. That’s better than third, and I can still race the clock for the sub-8, which had only been done once in race history, last year when Kurt said the course record at 7:49. I made a point to let ‘er rip right out of the gate. I was pushing up the big first hill and passed a few hundreds and even some 50 milers. There is still plenty of race left to completely explode, I reminded myself, but felt good cresting the peak and looking down at the mini-village of the start/finish area still in the dark of night. I was running hard. I put the lap on quite a few 50 milers, and we were all exchanging nice words of encouragement. I noticed in the warmth (compared to 2016), the 100 milers were in much better spirits. My pace was really good and I wasn’t giving up a second. However, the pain was nearly overwhelming and I couldn’t help but grunt, especially bombing down the technical descents. I was dreading the stupid sand cooler (as I called it in my mind), but knew once I hit daylight and that third aid station, it was time to really push it. When I got back to the aid station, they told me Dan left. Well, crap!! I didn’t stick around to chit chat, or eat food or drink, and just ran off. I didn’t care about much except the clock. I wanted to win but that’s out. I wanted under 8 and that’s totally feasible. I had timed out from the fourth aid station to the finish to be around 20 minutes if I’m running well. So that was my goal, to hit that fourth station by at least 7:40. I did not feel good down Ant Hill, but was cruising well on the road below. This is where time is made up, I thought, and was passing other racers like they were standing still. I was breathing really heavy and making strange noises. I saw a photographer ahead and tried to look smooth and strong despite the discomfort. I hit the last aid station at 7:35 and skipped it. Two in a row! That is risky, but I wasn’t hungry, wasn’t thirsty, and had some water. I knew I needed to eat a bit, so had a couple of chews to blast me off. It worked, and I was really moving on the trail section before the final road stretch. It was a lot longer than I’d remembered on the previous two loops. Finally, the trail snaked down to the gravel road and I knew I was close. With minutes to spare, I caught a glimpse of the gate, then campers and cars, and then the finish line. I ran up, feeling pretty well. My time was well under my goal of 8, but it was hard not to be bummed about second place once again. It was a hell of a race, though, and truly perfectly executed. What can you say when you believe there is no way to run even a minute faster? It was even harder, though, to see the results and know that Jason won by barely over two minutes. HOW?? He came up to me and congratulated me, but I was in a daze and didn’t get much time to pick his brain. Despite a few fleeting thoughts during the race of how running is terrible, immediately after finishing I acknowledged how fun the night run was and my excitement to do it all over again. Weird how that is.